Robert Glaser was an internationally recognized scholar in the fields of psychology, cognitive science, and learning and instruction. 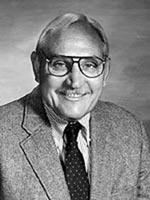 In 1963, Glaser co-founded LRDC at the University of Pittsburgh (with J. Steele Gow) and served as its director until 1997. The Center was among the first in the world focusing on learning studies, with a mission to investigate learning, instruction, and schooling for the improvement of educational practice. The Center’s interdisciplinary research agenda was established at a time when scholarship rarely involved researchers from diverse fields. LRDC continues that tradition today, bringing together leading researchers in the cognitive, social, and educational sciences. Glaser was the author or editor of more than 20 books and 200 articles during his career that spanned five decades. His broad and interdisciplinary scholarship targeted four key areas: the nature of aptitudes and individual differences, the interaction of knowledge and skill in expertise, the roles of testing and technology in education, and training adapted to individual differences. He developed the notion of individually prescribed instruction and contributed to a major theory of adaptive education. His interest in individual differences and the nature of expertise led him to explore thinking skills and how these might be taught. He introduced the idea of criterion-referenced testing and in the early 1960’s envisioned the use of computers to enhance instruction. Beyond his own contributions, the hallmark of Glaser’s career was his persistent capacity to detect emerging trends and to support the work of others in order to build a science of learning. Professor Glaser has served as president of the American Educational Research Association (AERA) and the National Academy of Education. He received numerous awards, including a fellowship from the Center for Advanced Studies in Behavioral Sciences, the John Simon Guggenheim Foundation fellowship, the AERA E. F. Lindquist Award, the AERA Award for Distinguished Research, the American Psychological Association (APA) Distinguished Scientific Award for Applications in Psychology, the American Psychological Society James McKeen Cattell Award, the Educational Testing Service Award for Distinguished Service to Measurement, the APA Division of Applied Experimental and Engineering Psychology Franklin V. Taylor Award, and the AERA Presidential Citation Award. He was a member of the Royal Norwegian Society of Sciences and Letters. He received honorary doctoral degrees from the University of Gothenburg (Sweden), Indiana University, University of Leuven (Belgium), McGill University (Canada) and University of Victoria, British Columbia (Canada). * The FABBS Foundation would like to thank Dr. Arthur Graesser, Dr. James Greeno, and Dr. Alan M. Lesgold for nominating Dr. Glaser for this honor and for leading the effort to spread the word about his nomination. Would you like to honor Dr. Glaser? It isn’t too late to have your name added to the list of donors! You can make your donation to Dr. Glaser’s “In Honor Of…” campaign at any time.